Detail: This amazing 18thC Egouttoir had to functions and thus it is a real find! The knob in the center was to hold the cheese (in a wooden collander) and let the water drip. After, one placed the cheese around the piece which became then, a faisselle (mold). The style is pure 18thC Auvergne. 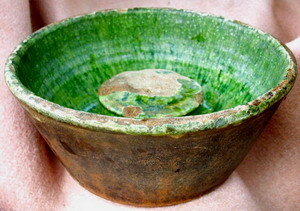 Stunning green to the interior and the form shape and coloring of the clay. A rare piece of Art Populaire. 10 inches across and 4 inches in ht. I doubt we will have the luck to find another!